1) It’s surprisingly good. I say “surprisingly” because most heavily advertised summer blockbusters are terrible. See it in the theater if you can, ideally on an IMAX screen. I did. 2) The movie is very good at conveying a lot in a small space—the cluttered domestic scenes set up family tension. Details proliferate at the edge of the movie. Watch for video cameras and film-related objects. 3) I identify with the fat kid because he’s the artist. He’s not the hero and doesn’t get the girl. When mysterious things begin happening, he’s the one who still cares most about getting the shot. Good for him. Intense focus on “production values!” (his rallying cry) never hurts. 4) Like Umberto Eco’s The Name of the Rose, this text speaks to other texts. For some reason, I always love the scenes where animals run away while doofus humans tarry. Someone says, “You heard what old man Woodward said,” as if the movie was a Scooby Do variant. 5) Super 8 feels like one the 12-year-old Abrams would’ve liked to make, if he’d had the skill; now he does. It’s nice to see adolescent dreams rise. 6) Ignore the plot holes and implausibilities, which are numerous. 7) Anything that disrupts electricity and electrical devices is scary. If you’re writing a novel with any kind of supernatural element, remember this. We’re still afraid of the dark, and we’re dependent on an electrical grid few of us understand. 8) Embrace the impetus to explore. 9) This is a kids’ movie primarily because there weren’t real consequences; I will leave that statement ambiguous for those who haven’t seen the movie. EDIT: Even if you don’t normally read the comments, see those left by Jason Fisher. I saw it on IMAX opening night — fantastic! It made me very nostalgic. Not only the set pieces, props, clothes, music, etc. — in 1979, I was the same age as the characters, give or take a couple of years — but the style of film-making too. It all harkens back to a simpler time. Or at least, to a time that felt simpler, at the time. The attention to detail was amazing. That poster of the space shuttle on Joe’s bedroom wall? I had the very same one myself. 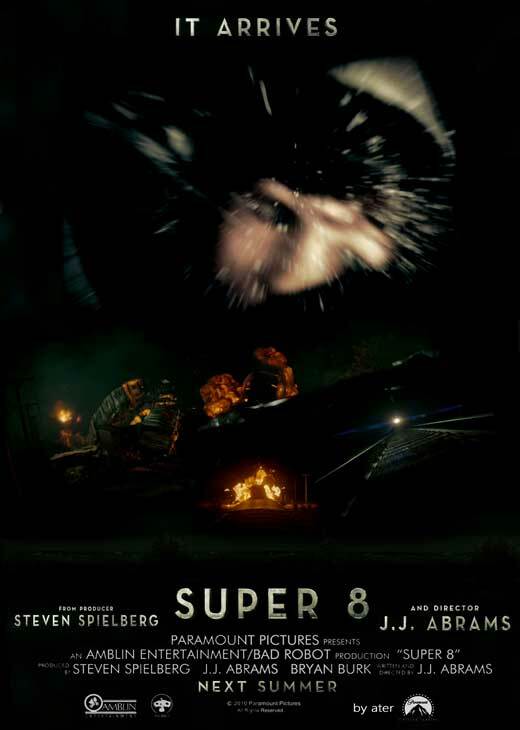 Super 8 is being compared to E.T., in both good and bad ways, in both raves and more tepid reviews. The comparison is apt, and for me, it’s all good. Yeah—the movie also didn’t drag towards the end. The movie did want life to feel simpler while pointing out that it wasn’t—Did you also notice the reference to Three Mile Island on the TV? Then there was the more obvious town hall meeting where everyone wanted to blame the disaster on the Soviets, which echoes the blaming of contemporary problems on external forces that are perhaps created by the very responses that are supposed to solve them. may per be read in three ways. The first category of readers will be taken by the plot and the coups de scene, and will accept even the long bookish discussions and the philosophical dialogues, because it will sense that the signs, the traces and the revelatory symptoms are nesting precisely in those inattentive pages. The second category will be impassioned by the debate of ideas, and will attempt to establish connections (which the author refuses to authorize) with the present. The third will realize that this text is a textile of other texts, a ‘whodunit’ of quotations, a book built of books. He goes to cite a critic who “suggests that here is an implied hierarchy in the listing of these kinds of reading, the most approved being the last.” Movies obviously cannot quote in the same books do, or not do very much—they seldom are composed solely of direct splices from other movies—but I think this movie does so so consciously that it invites the comparisons to E.T. and other movies too. Which isn’t a bad thing—in doing it so, it becomes its own movie, just The Name of the Rose becomes its own book, very much singular, even as it invites comparison to Sherlock Holmes, Borges, and so forth. Yes, I think you’re absolutely right. Other films I felt Super 8 very consciously invoking were Close Encounters of the Third Kind (also dir. Spielberg), War of the Worlds (again, the Spielberg remake, starring another of the Fannings), The Goonies (dir. Richard Donner, but written and executive produced by Spielberg), and Stand By Me (dir. Rob Reiner). I did notice the reference to Three Mile Island, topical both in the year the film is set and now in the year it was released (the Japanese Fukushimi Daiichi facility). Likewise, I mentioned the space shuttle program: again, topical both in the film’s chronology (the debut of the shuttle program was just a couple years before the film is set) and in our external chronology, with the shuttle program coming to a close next month. I think all of this was very deliberate. The film was artfully constructed, and meta at many points, and in the best ways.